This is captivating adventure story that you can share with your older children. 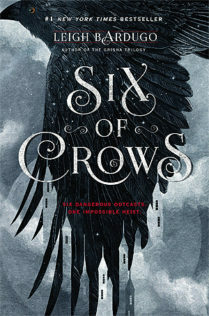 Six of Crows is a story of six teens with nothing to lose, and thirty million kruge to gain, if they can break into the most impenetrable fortress to rescue a scientist making the most atrocious drug imaginable. The gang is made up of Kaz Brekker, a boy from the Barrel, the poorest and most dangerous place in the Ketterdam. Kaz rose from a naive boy to a talented thief and leader the gang known as the Dregs. There isn’t a lock he can’t pick or a job he can’t plan. While most believe Kaz wears gloves because there is so much blood on his hands they are permanently stained, there is a crueller story behind Kaz desire not to touch other people. Inej, the pretty Suli girl with her lovely coffee skin, abducted from her acrobat family by slavers and sold to the Menagerie, the pleasure house also known as the House of Exotics. Inej was rescued from that life by Kaz Brekker who convinced the local boss to buy her indenture since Inej’s unique skills were better suited to collecting the dirty secrets of the rich and powerful. Her performance upbringing gave her ability to move silently and climb across the tops of buildings which has earned her the name of the Wraith. Nina Zenik is a former Ravka soldier and spy. Nina is one of the Grisha, those born with supernatual powers. As a heartrender, Nina can stop a heart with a wave of her hands. 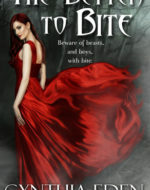 Nina was captured by the Fjerdan drüskelle, who believe it is their purpose to hunt down and kill the unnatural Grisha. Mattias Helvar one of the Fjerdan drüskelle who captured Nina and was taking her to Fjerda for trial until he was arrested as a slaver and thrown into Hellgate prison. Nina and Matthias are trapped in a love/hate cycle; enemies who try to fight their desires. The Fjerdans and their propaganda of hate against the Grisha and their witch hunters known as drüskelle remind me of Nazi and the Hitler Youth Groups raised in hate to become the SS soldiers. Jasper is a member of the Dregs. A former farmer who makes a better sharpshotter than cardshark. Wylan Van Eck is a demolition expert and son of the man who hired this crew. Kaz keeps him as much an insurance policy as a needed member of the team. As the youngest member (only 15) and the son of a rich merchant, Wylan makes us realize that while we might like some of the others, such as Kaz, some of the things they do tread over the line into a darker world. In Six of Crows, every country is going to send a team to try and break out the scientist out of the Ice Court. No one would bet on this ragtag bunch to make into the inpenetrable fortress, let alone out again. But then again, they aren’t a mercenary team. They are a group of thieves and killers who might just do the impossible. The question isn’t if they can; it is if they should. The scientist Bo Yul-Buyur has taken a relatively harmless stimulant drug, jurda, and created jurda parem. 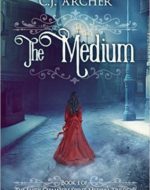 Jurda parem enhances the power of the Grisha in inimaginable ways, leaving fabriaktors able to change lead to gold or healers who are able to control minds but can anyone really control those Grisha under the influence. Yet, the most horrific part is the immediate and unstoppable addiction which jurda parem creates. The Grisha waste away chasing the need for more of the drug. 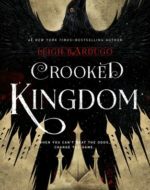 With thirty million kruge on the line, can Kaz and his team break the scientist out of the Ice Court, and even if they can, do the turn Bo Yul-Buyur over to someone who will make him create more of the most dangerous and addictive drug ever created? This story is a favorite with my teen so I decided to give it a try. It was captivating story of how this bunch of teens figure out how to get into the Ice Court and then back out again. Not all their plans go smoothly, and in between the action, we get backstories on everyone. This story is geared towards the younger teen crowd but it still held my attention. While some parts can be violent, most other things such as the fact that Inej was abducted and sold as a prostitute are more glanced over. We don’t hear graphic descriptions how creepy, old men touched 15-year-old Inej. Just that she was forced to work in a pleasure house and no real discussion of what that means. Inej was my favorite character while my daughter favored Wylan. It was also interesting to discuss plot and characters with her and see the story from a younger person’s perspective. The romantic in me was appeased with the awkward teen feelings between Kaz and Inej and Nina and Matthias, and there was even a hint of something between Wylan and Jasper. It was almost a Nora Roberts romance trilogy set up. Each chapter is from another character’s POV and the audiobook uses different narrators for each which was good as a distinction, except then each narrator has difference voices for the other characters who were talking so that we hear Kaz interpreted in several different voices. This story does end in a cliffhanger, but thankfully the second part is already out so you don’t have to wait to continue. She wiped her knives on her leather breeches and returned them to their sheaths, then backed up and took a running start at the nearest cargo container. As her fingers gripped the rim, she felt a piercing pain beneath her arm. She turned in time to see Oomen’s ugly face split in a determined grimace. All the intelligence she had gathered on the Black Tips came back to her in a sickening rush–Oomen, Geels’ shambling enforcer, the one who could crush skulls with his bare hands. He yanked her down and grabbed the front of her vest, giving the knife in her side a sharp twist. Inej fought not to black out. “That so?” He slammed her up against the crate, and pain crashed through her. Her toes only brushed the ground as blood spurted from the wound on her side. Oomen’s forearm was braced against her shoulders, keeping her arms pinned. She crossed one ankle behind the other and heard a reassuring click. She wore the pads at her knees for crawling and climbing, but there was another reason, too–namely, the tiny steel blades hidden in each of them. “The secret,” she panted, “Is to never take your eyes off the scorpion’s tail.” She brought her knee up, jamming the blade between Oomen’s legs. He shrieked and released her, hands going to his bleeding groin. She staggered back down the row of crates. She could hear men shouting to each other, the pop of gunfire coming in smatters and bursts now. Who was winning? Had the others made it to the schooner? A wave of dizziness rolled over her. When she touched her fingers to the wound at her side, they came away wet. Too much blood. Footsteps. Someone was coming. She couldn’t climb, not with this wound, not with the amount of blood she’d lost. She remembered her father putting her on the rope ladder the first time. Climb, Inej. The cargo containers were stacked like a pyramid here. If she could make it up just one, she could hide herself on the first level. Just one. She could climb or she could stand there and die. She willed her mind to clarity and hopped up, the fingertips latching on to the top of the crate. Climb, Inej. She dragged herself over the edge onto the tin roof of the container. It felt so good to lie there, but she knew she’d left a tail of blood behind her. Once more, she told herself. One more and you’ll be safe. She forced herselt up to her knees and reached for the next crate. The surface beneath her began to rock. She heard laughter from below. Desperately, she reached for the lip of the next crate again and gripped it, fighting through an onslaught of pain as the container under her dropped away. Then she was just hanging, legs dangling helplessly down. They didn’t open fire; they wanted her alive. She didn’t know where the strength came from but she managed to pull herself over the top. She lay on the crate’s roof, panting. Just one more. But she couldn’t. Couldn’t push to her knees, couldn’t reach, couldn’t even roll. It hurt too much. Climb, Inej. “I can’t, Papa,” she whispered. Even now she hated to disappoint him. Move, she told herself. This is a stupid place to die. And yet a voice in her head said there was worse places. She would die here, in freedom, beneath the beginnings of dawn. She’d die after a worthy fight, not because some man had tired of her or required more from her than she could give. Better to die here by her own blade than with her face painted and her body swathed in false silks. A hand seized her ankle. They’d climbed the crates. Why hadn’t she heard them? Was she that far gone? They had her. Someone was turning her onto her back. She slid the dagger from the sheath at her wrist. In the Barrel, a blade this sharp was known as kind steel. It meant a quick death. Better that than torture at the mercy of the Black Tips or the Razorgulls. May the Saints receive me. She pressed the top beneath her breast, between her ribs, an arrow to her heart. Then a hand gripped her wrist painfully, forcing her to drop the blade. The rasp of stone on stone. Her eyes flew open. Kaz. He bundled her into his arms and leapt down from the crates, landing roughly, his bad leg buckling. She moaned as they hit the ground. He must be running. Her body jounced painfully against his chest with every lurching step. He couldn’t carry her and use his cane. She tried. Her vision was blurring, but she could make out a pale, shiny scar on Kaz’s neck, right beneath his jaw. She remembered the first time she’d seen him at the Menagerie. He paid Tante Heleen for information–stock tips, political pillow talk, anything the Menagerie’s client babbled about when drunk or giddy on bliss. He never visited heleene’s girls, though plenty would have been happy to take him up to their rooms. They claimed he gave them the shivers, that his hands were permanently stained with blood beneath those black gloves, but she’d recognized the eagerness in their voices and the way they tracked him with their eyes. “I can help you,” she said now. She couldn’t remember. There was something she was supposed to tell im. It didn’t matter anymore. She didn’t hear his reply. The world had grown very dark indeed.